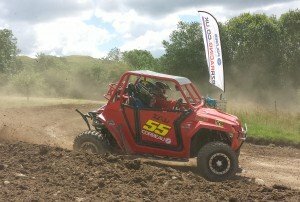 Round five of the Polaris RZR British Side by Side Championship headed back across the border in to Wales, this time to Neuadd Farm in Pen-y-bont on the outskirts of Llandrindod Wells. A heavy downpour on Saturday afternoon dampened down the track but a scorching hot Sunday dried out the surface and left the last block of racing a little bit on the dusty side. With the drivers being split in to two groups it was essential to post a good qualifying session and with two sessions per group there was plenty of opportunity. It was close at the front in the opening session with Dean Hyde in the Hyde racing Polaris pipping James Chorlton in the wefightanyclaim Polaris by a mere 0.078 of a second. 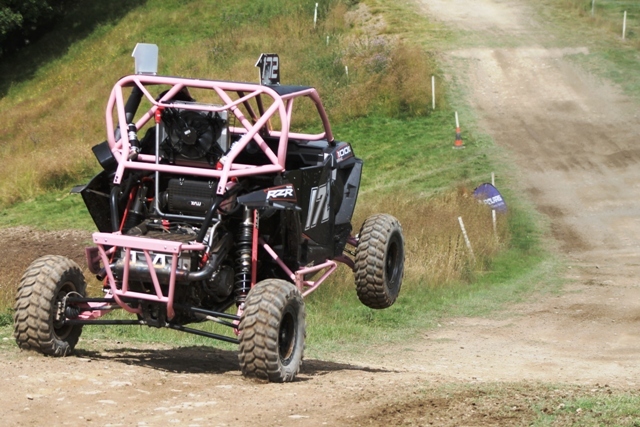 Championship leader Alfie Hyde in the second Hyde Racing Polaris was out in group two and straight from the off set a time that was 3.5 seconds quicker than group one Sam Berry and Robert Lloyd in the Berry farming Polaris setting second fastest group 2 time, albeit over six seconds adrift of Alfie Hyde who had celebrated his 21st Birthday two days prior. The second block of qualifying proved to be faster as the track dried out and Chorlton turned the table on Dean Hyde posting a 1:54.485 lap. Fastest of the 900cc class was the third machine of the Hyde Racing team with John Lyne at the wheel ahead of series newcomer Jack Rowe. Alfie Hyde once again went out and posted the fastest time giving pole for Moto 1 but the gap had come down to just over a half a second.With the top twelve going through to the Pro group of racing for the day it was the pairing of Mark McCann and Richard Brenton in the Fro Systems 900 Polaris that missed the cut by half a second. Expert moto one was the first out on to the track and unsurprisingly it was McCann and Brenton that emerged at the front from pole position followed by the Jenkinson pair in the 900 Polaris, Jenkinson dropped down the order on lap three after collecting a puncture on the hard packed surface and Joe and Andy Bennett took up the chase in the abcast Engineering machine. McCann went on to take the first win of the day from Jenkinson with Stewart Gubbins coming through the pack to claim third. 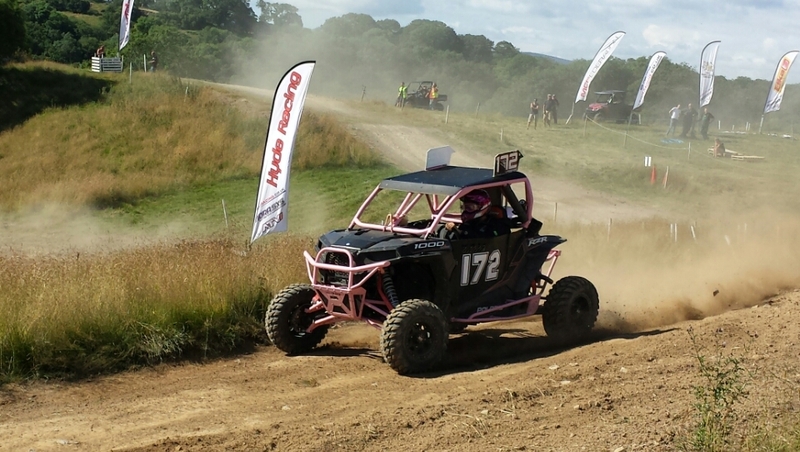 Alfie Hyde lined up at the front of the field in the first Pro heat of the day and got a bit overexcited at the start meaning the drivers had to line up for a second attempt. The short start straight got the drivers bunching in to the first corner but it was Alfie Hyde that emerged at the front with Chorlton, Dean Hyde , Jamie Thwaites in the Cagedsteel 1000 Polaris and Jack Rowe close behind. 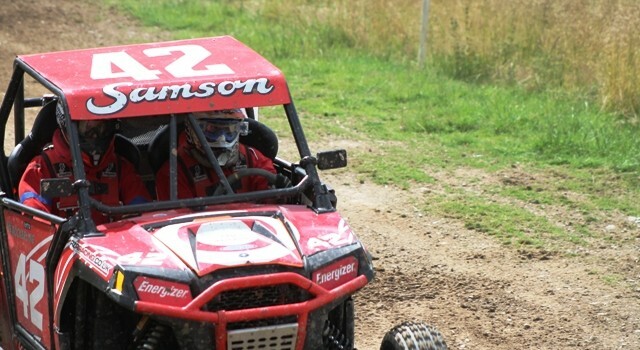 Chorlton went for an early manoeuvre around the outside of Thwaites on lap one, collecting a dozen track markers and damaging the front end and sidelining the Polaris. Alfie Hyde was in dominant form and was never challenged for the lead, Dean Hyde suffered some gremlins and slipped out of second allowing Rowe through. Driver of the Moto went to Lyne after a disappointing start saw him pull through from the back of the pack to claim third at the flag. Expert Moto two saw McCann and Brenton get away at the front once again and he must have been kicking himself for not getting in to the Pro group as once again there was nobody in the field to challenge him for the lead that he held to the end. 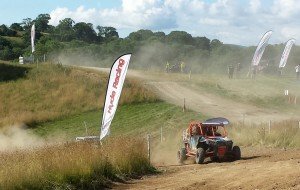 Joe and Andy Bennett were looking secure in second as the battle raged behind them with Gubbins first losing out to Matt Neal and then to Shaun and Erin Jenkinson. Neal went missing on lap five leaving Gubbins to push Jenkinson acorss the line closely followed by Ian and Dan Gibbons. Having qualified well Adrian and Callum Loveridge were suffering from steering issues for the second time in two motos. Alfie Hyde once again got away at the front of the field in the Pro moto two and determined to get a better start Lyne spun the machine in the first corner and was collected by PAR Homes Paul Rowlands putting both out of the race. Rowe was once again looking good for a second place until the gremlins set in with two laps to go leaving him with an eighth place finish. Starting from the back of the pack, life was going to be difficult for Dean Hyde and a broken drive belt on lap 4 once again left him out of contention. There was a terrific battle for what was to end up as second place between Stephen Berry, Richard Avis, Jason Rowlands, Josh and Guy Barrett and Sam Berry, with drivers jostling for position but defending at the same time, it looked as if the places would stay but Rowlands machine spluttered as he took the one lap board, Avis made a move on Stephen Berry allowing the Barretts through and then Stephen Berry went missing on the last lap, Avis retook Barrett for second and Sam Berry shot past Rowlands for fourth. 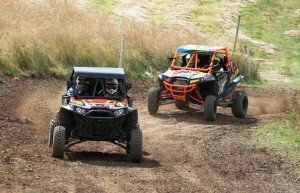 The third Moto for the Experts was a much more settled affair with McCann and Brenton once again getting away at the front and after some early pressure picked up their third comfortable win of the day. Bennett put on the early pressure with passenger Andy spending the race clutching the door that had sprung open on lap two and once again came home in second with Jenkinson in third. Following a back row start, Loveridge was making ground through the field having fixed the steering only to have a radiator let go with three laps to go. The expert overall win went to McCann and Brenton with Joe and Andy Bennett second and a consistent Stewart Gubbins in third. Moto three for the Pro group and it was no surprise to see Alfie Hyde once again out front and this time it was Dean Hyde getting it all wrong in turn one and going straight on in to the catch fence. Avis was running in an early second spot but was under huge pressure from Barrett and Paul Rowlands. Barrett made a lunge for second place which left the door wide open for Rowlands to slide up the inside of both and take up the running in second. Sam Berry then got in to the mix and made an uphill pass on Avis just as the rear suspension gave way on the Barrett machine. The same fate fell on Paul Rowlands just a lap later allowing Sam Berry and Robert Lloyd to cross the finish line in second ahead of Avis and Stephen Berry and Jason Rowlands. Overall victory went to Alfie Hyde with a maximum score ahead of Avis with Berry and Lloyd taking the third podium step. 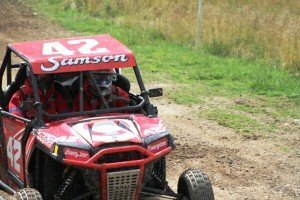 When all of the class points were worked out it was Avis at the head of the 900cc Modified class, 29 points clear of McCann and Brenton and Josh and Guy Barrett a further 33 points back in third place. 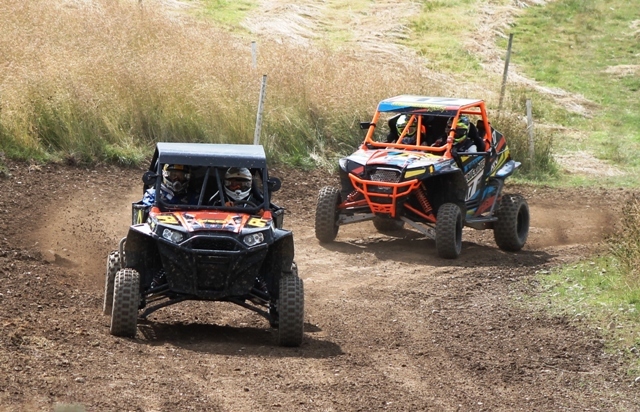 McCann and Brenton head the Barrett pairing with Sam Berry and Robert Lloyd in third in the 900cc Team standings. Despite having a disappointing weekend it is Jamie Thwaites that still heads up the 1000cc standard class ahead of Bradley Visser and Alan Lyne who have both missed the last two events. 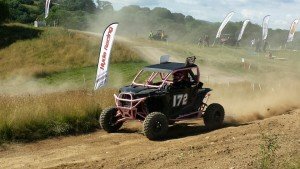 With a difficult weekend for most of his competitors and a maximum score for Alfie Hyde he has increased his 1000cc Modified class lead to a whopping 72 points ahead of Paul Rowlands, with three motos and no points Dean Hyde dropped down in to third place. 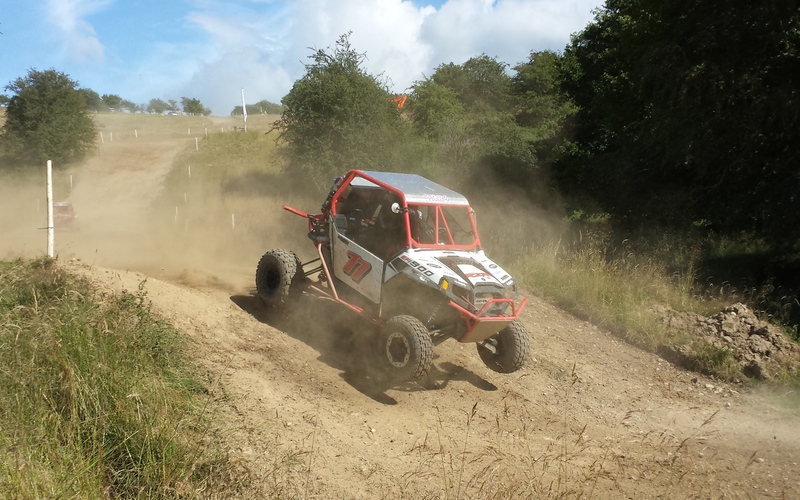 It is much tighter in the overall MCF official British SXS Championship where Alfie Hyde sits at the top but only by 27 points from Richard Avis with Mark McCann and passenger Richard Brenton sitting in third. The next round of the Championship heads off to Dunston Moto Park at Pendridge on August 10th.